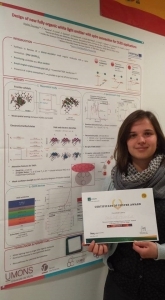 Pauline Tourneur, PhD student in our laboratory (under the direction of Jérôme Cornil), won the Best Poster Award at the Conference “Advances in Organic and Hybrid Electronic Materials” held from 17 to 20 March in Dubrovnik. She presented her thesis work on the development of new light emitting molecules for OLEDs. Congratulations to Pauline !